Please look at this exchange on Twitter. I'm asking for help in answering three questions (1) I have always assumed, as John Higgs has, that the yellow submarine in Illuminatus! was a reference to the Beatles song, but did Wilson or Shea ever say anything about that? (2) Did Yellow Submarine influence the KLF? (3) Do the 23s and apple throwing in the movie show a Discordian influence? Note the 23 on the cover. The connections seem to be synchronicities. Discordianism was still waaaaaaay underground and only really starting to find a voice in and around 1968. From letters I've seen RAW and Shea really started getting involved with Discordianism in 1968. I think I could even pin down the date when RAW first talked about 23, but it was some time in 1968 or afterwards, I saw it mentioned in some of the letters in my possession...RAW picked it up from Burroughs, though, so Burroughs, I believe was talking about 23 pre 1968. The 1st edition of Principia Discordia was only five copies, just circulated between a few folks. The 2nd edition was in 1969, and only 100 copies...Principia really only started to get circulated after 1970….although Underground papers sometimes carried Discordian stuff…but of course, many times it was prank stuff and no one was sure where it came from, and often didn’t even identify itself as Discordian….it’s complicated. Kerry Thornley (around 1966-67) wrote about envisioned anarcho-libertarian groups that would live on the sea free from governmental control, and RAW picked up on that theme in Illuminatus. 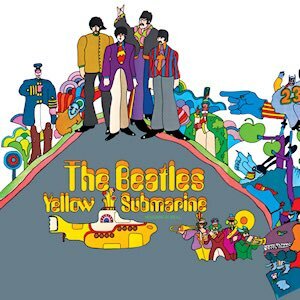 My bet is that RAW might have been influenced by Yellow Submarine also and morphed the two ideas together, maybe even subconsciously...and then Ken Campbell (or his confederates) linked the two, Illuminatus and Yellow Submarine. Thanks Adam, yes that sounds right. It seems unlikely that Discordianism made it across to London by 1968. That said, it's possible the 23 Enigma itself could have been known - Burroughs spent some time in London (not sure of the exact dates) and there are possible contagion vectors (eg Burroughs --> Leary --> Lennon). That said, its most likely a coincidence. And the apples are simply a reference to the Beatles label/company, and the yellow submarine is just a song they wrote in '66. It's just that, taken all together, and mixed with the mind expanding, chaotic cartooon fun of the film - it seems like one hell of a premonition, doesn't it? McCartney hung out with Burroughs when Burroughs was living in London. They made some audio experiments together, See, "Call Me Burroughs'" by Barry Miles. Yeah, Burroughs could be the 23 connection. We all live in a Yellow Submarine. Fnord. I spoke to Dr. Bob Hieronimus who wrote 'Inside the Yellow Submarine' over the weekend, - he carried out extensive interviews in the 90s with the many writers and animators and his conclusion was that all perceived mythology is purely co-incidental - he more than anyone was convinced there was a connection until he started to research. His comments tally with Adam and John’s. I still feel however that within that large team (200 artists alone) there may have been one artist who was maybe familiar with the Principia Discordia or the 23 enigma and drew the 23 on the Butterfly Stompers chest as a cheeky nod !!? I have no proof but I am trying to find out who's decision it was to for there to be 23 butterfly stompers - somebody must have decided that! In one of the interview transcripts pyramid is actually supposed to be some elaborate bandstand… “Bob Hieronimus: The Yellow Submarine is located atop of what I had thought was, it looked like a Mayan type of pyramid. And of course, closer scrutiny, and I've watched this in slow motion and everything else, Heinz, it turns out to be a band stand. Which could be interpreted still along the same lines as a Mayan pyramid, did you give that any thought to that possibility? The second point was did it influence RAW work on Illuminatus! that I am still endeavoring to find out. I hope to get back to you, with more! P.S. Really reading into it now but what with Old Fred there’s 5 in that sub. ha ha! P.P.S. JAMMs first every release (JAMs 23) started with Beatles ‘all you need is love’, a track used in YS. Martin, I would have to pull out all my copies and look to be 100% certain, but I'm pretty sure the early editions of Principia Discordia (editions 1 - 3) did NOT have any 23 references in them. The 4th edition of Principia Discordia (published in 1970) DOES have a 23 reference. It was the 4th edition that really started to first incorporate ideas from RAW, Shea, Benares and a few other Discordians in it. So I would tend to think if the Yellow Submarine artists picked up on the 23 meme it was from Burroughs...it's not entirely out of the realm of possibility that RAW might have mentioned it somewhere, but I think there is more of a chance that someone might have picked it up from Burroughs, if we are talking 1968 or before. Broadly speaking, perhaps only a few hundred people knew about Discordianism until Illuminatus came out (in 1975)...and even then most readers really weren't sure if it was a real thing or not...that's what makes it so odd that the number 23 appears on the Yellow Submarine album cover.